This classic, creamy pot pie uses leftover turkey, vegetables and buttery rosemary biscuits to take you back down your childhood memory lane. Don’t forget to enter my 1st Blogiversary Giveaway!!!! 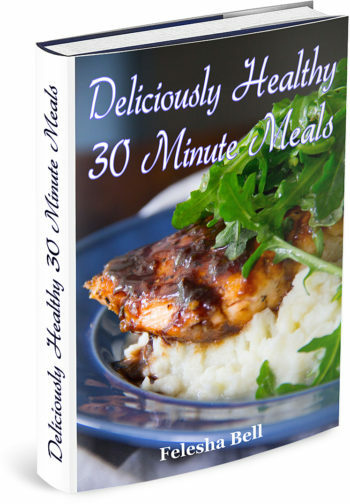 Are you still up to your elbows in leftover turkey and desperately looking to use it up somehow? Well, I’ve got a tastefully delicious meal that may be worthy of buying a roasted turkey breast even when you don’t have any leftovers. It’s that yummy! If you read my previous post, Apricot Glazed Cornish Hens with Rice Pilaf, you’d remember that I stated that I wouldn’t be bothered with a turkey this year. However, my mom gave me some of her leftover fried turkey just to make this awesome dish for her and myself, of course! We usually have it every year after Thanksgiving and we always look forward to it. It’s creamy…it’s hearty and comforting to the soul. It reminds me so much of my childhood. I would always ask mom to buy me those frozen chicken pot pies as a child. I can just remember the yumminess of it all. Well those childhood chicken pot pies have nothing on this homemade version. You gotta love homemade as you know exactly what you’re putting into your body and you won’t be so puckered from the sodium intake in those things, right? It’s a breeze to put together and you’ll be begging for more. I toss in fresh veggies, make a roux, pour in chicken stock and heavy whipping cream along with the leftover turkey. Then I top the mixture with frozen biscuits, melted butter and a little rosemary and then I start dancing as I wait for this tasty dish to emerge from the oven. This is a must try! So don’t turn your nose up to that leftover turkey. 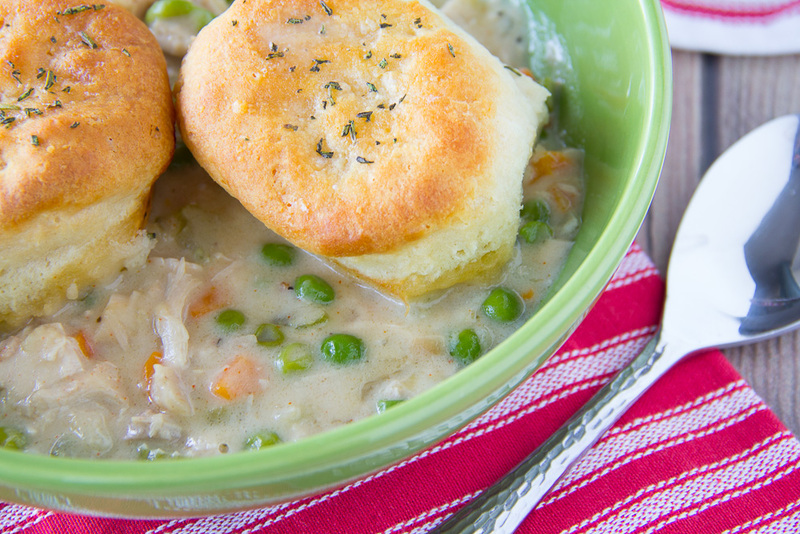 Recreate something delicious like this Leftover Turkey Pot Pie. John 6:12 states, When they were filled, he said unto his disciples, Gather up the fragments that remain, that nothing be lost (KJV). I believe that Jesus said this because He wanted to use those fragments to bless even more people. And boy was this tasty pie a blessing to all that had their fill. Say Grace and enjoy! In a large, heavy-bottomed oven proof skillet over medium-high heat, melt 3 tablespoons of butter and saute onion and celery until tender. Add sage, peas and carrots, 3 T. of butter and melt, stirring until combined. Add flour stir to coat the vegetables, cooking for about 2 minutes. Add the chicken stock and stir allowing the liquid to thicken a little. Stir in cream. Season the sauce with salt and pepper to taste. Remove from heat and stir in the turkey. Place frozen biscuits directly on top of the filling making sure that the sides are touching. 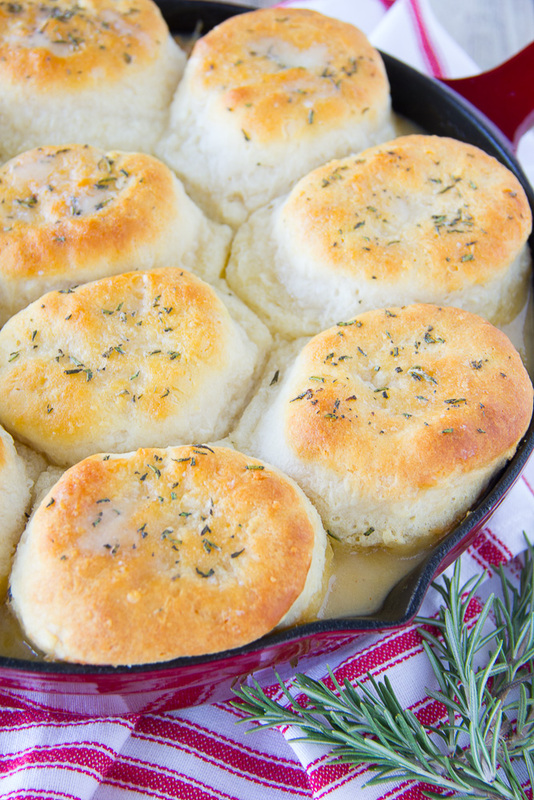 Brush the tops of the biscuits 3 T. melted butter, and sprinkle with rosemary. 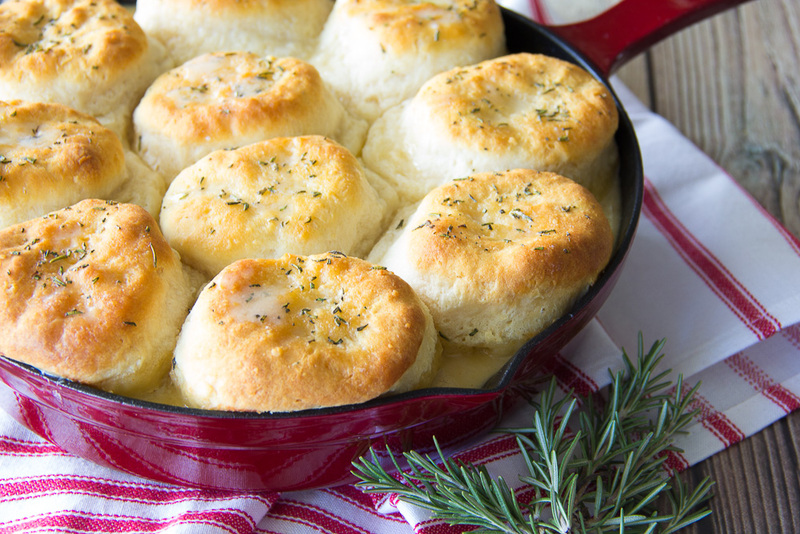 Bake for 35 minutes or until the tops are golden brown and the contents are bubbly. Say Grace and enjoy! What a perfect way to use that leftover turkey. Too bad I don’t have any leftover… but I do still have a frozen turkey so maybe till will happen post-Christmas. We have SO MUCH turkey! And I know that at least one of us in the house is already tired of eating it as straight up leftovers (that person is not me by the way) so I’ll definitely see if turkey pot pie would be an acceptable alternative. Thanks for sharing! Hey Meaghan! I wish I had more of this in front of me right now! Lol! Thanks for stopping by!